Experts answer your questions on the emerging field of 3D bioprinting. Dr Dan Thomas (DT) of Swansea University. Would 3D printing technology be able to reproduce working glands such as the pancreas to assist in insulin production? DT: With future developments and research, this is an interesting application. However, biological architectures are extremely complex to engineer, and number of the cellular mechanisms are still not fully understood. What may be the best alternative approach is in developing the capability to make small engineered tissues for acting as dynamic biotools to repair damaged glands or tissues. Macro-tissue engineering is something that is currently very interesting. VM: This question does not have a yes/no answer. Tissue engineering is a highly inter-disciplinary field that integrates the principles of physics, chemistry and biology to engineer artificial organ and tissue systems for replacing damaged tissues in the body. Bioprinting [the term given to the technology that utilises 3D printing for tissue engineering applications] is one of the major tools in tissue engineering that has high potential to pioneer the efforts made to engineer artificial organs. Bioprinting has already made a lot of strides in tissue engineering in the recent past and it is growing at a rapid pace at the moment. In the next five to 10 years, there is a huge scope for bioprinting to reach its pinnacle by enabling complex architecture, high viability, preservation of cell functionality and high speed of fabrication. However, there are other aspects that have to be advanced along with bioprinting to reproduce working glands outside the body such as designing complex biomaterials that satisfy the needs of cells at multiple levels, finding proper and sustainable cell sources, molecular cues and so on. Hence the success of tissue engineering depends on all the tools employed in tissue engineering, and bioprinting is only one of many such major tools. So advances in bioprinting alone will not guarantee organs such as the pancreas but it will definitely push the boundaries of paths leading to such innovation. AA: The pancreas is one of the body’s solid organs, a category that also includes the liver, kidney and heart. 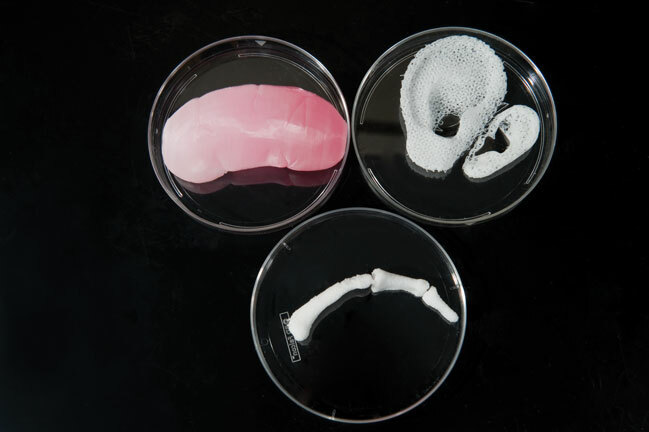 Our experience in the 3D bioprinting of solid organs includes a long-term project to print a human kidney. And, for a project funded by the Defense Threat Reduction Agency, which is part of the US Department of Defense, we are working to print miniaturised liver and heart tissue that could be used to test drugs. So in concept, it should be possible to print pancreatic tissue. However, engineering any organ – whether by printing or another method – requires many years of scientific endeavour. The central challenge is to reproduce the complex micro-architecture of living tissue to ensure that printed tissues have biological function. This is the kind of technology that gets misinterpreted by the press, so can you manage our expectations by telling us what is possible right now, and where the next 10 years will take us? DT: Bioprintable tissue for transplantation is a technology that is at least 20 years away. The most likely application for bioprinting technology during the next 10 years will be that of 3D bioprinted tissue tools. This will provide improvements in pharmaceutical testing and then subsequently cancer tissue models. At the moment, the ability to control and manipulate a few hundred million cells is achievable to make simple heterogeneous tissue types. However, tissues for reconstructive surgery offer a different level of complexity. Consider that we need approximately 80 million cells for each millilitre of bioprintable material. The difficulty of harvesting, culturing and then handling this vast number of progenitor cells is very high. The ability to deposit complex bone materials into an anatomically correct geometry using 3D printing technology is currently a process that within the next five years will be harnessed. VM: In the next 10 years, bioprinting definitely has the potential to bring us close to the generation of artificial organs, but to bring about the complete success of tissue engineering, the advances made in bioprinting has to be accompanied by the advances of the other tools involved in tissue engineering. 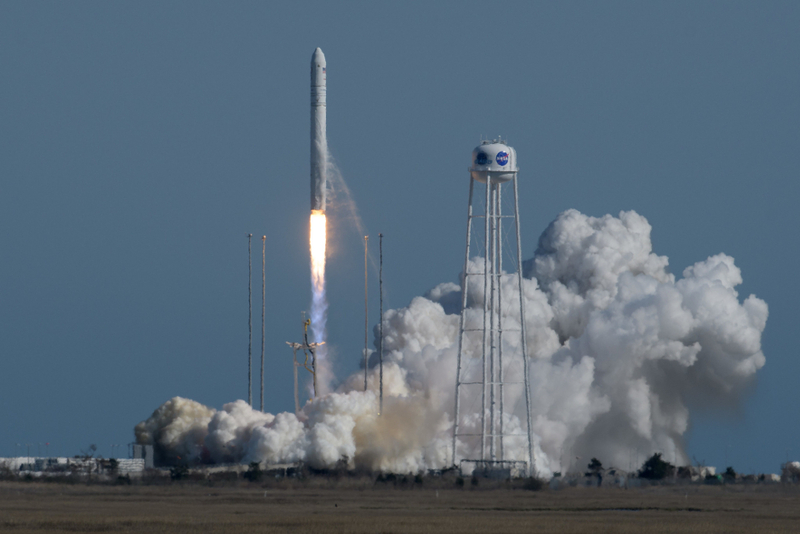 Having said that, there is a high possibility for an engineered tissue to make its presence in clinics in the next 10–15 years for aiding therapies. AA: You are correct that many people may have unrealistic expectations about 3D bioprinting. The technology itself is not ‘magic’ – it is simply a way to scale up the current processes we use to engineer organs in the laboratory. Before any organ can be engineered – whether it’s printed or built by hand – there is much groundwork that must be accomplished. Vital to the process is a thorough understanding of cell biology. Scientists must determine not only what types of cells to use, but how to expand them in the lab and how to keep them alive and viable throughout the engineering process. Do they need to be embedded in biocompatible material? If so, which biomaterial is most suitable? The bar for success is high – the structures we engineer must function like native tissue. 3D bioprinting is a relatively new field and printed tissues have not yet been implanted in humans. Within the next 10 years, we expect clinical studies to be under way for simpler tissues such as bone and muscle. DE: We’re at a point where 3D printing/additive manufacturing technology has reached a level of maturity for the more wide-spread production of non-active, long term implantable devices. The freedoms associated with 3D printing currently enable designers to work with surgeons to undertake procedures that would have been either impossible, or extremely unlikely to succeed with any accuracy only a few years ago. Combining the design and production of transient use surgical guides with precisely detailed implants is now gaining popularity in the UK since it enables a disease to be removed and the anatomy reconstructed in one operation period. Looking to ten years ahead, research into bio-active implantable devices is likely to have matured to have become more widespread. Once design rules have been established, clinical benefits proven and economics have been improved, this is likely to have a particularly large impact to soft tissue reconstruction. What sort of engineered device is able to hold, move and release lab-grown microtissues without adversely affecting the viability of the cells? DT: There are a number of different technologies, which resulted in early progress in the field. Work by the Wake Forest Institute is really pushing the boundaries. 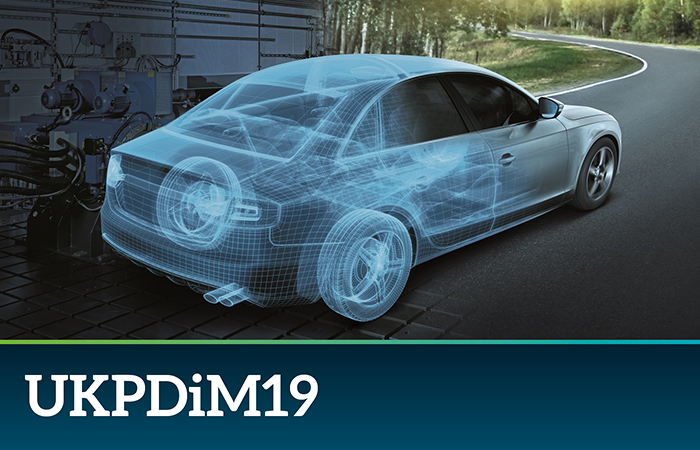 Direct deposition is one family of technologies that is currently successful at producing simple architectures, but the resolution is not really there yet with regards to complex tissue architectures. I feel that harmonic levitation and laser curing of photo-curable scaffolds will be a key realisation of bioprinting technology. We have started a major programme of bioprinting combined with microtissue carriers in which spheres of cells can be placed together, which is an optimum approach for producing a simple tissue in this way. Mobilisation of cells and precise deposition with harmonic energy could become the next state-of-the- art bioprinting technology. We are currently working on the first stage of this programme, which involved developing the software tools required to build complex architectures composed of multiple cell types. VM: Viability is the major goal to achieve while successfully transforming a normal 3D printing technology into a bioprinting technology. Hence, almost all the different methodologies used for bioprinting have achieved high/reasonable viability. Examples are direct-write printing, inkjet printing, laser printing and so on. 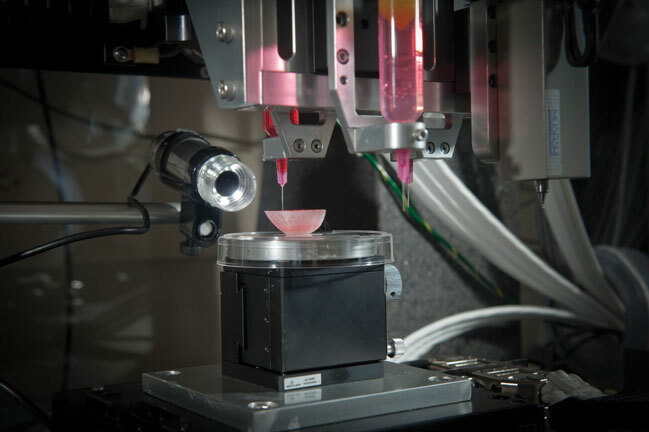 Viability concerns during bioprinting have become a thing of the past because of the advances made in the above-mentioned printing technologies. 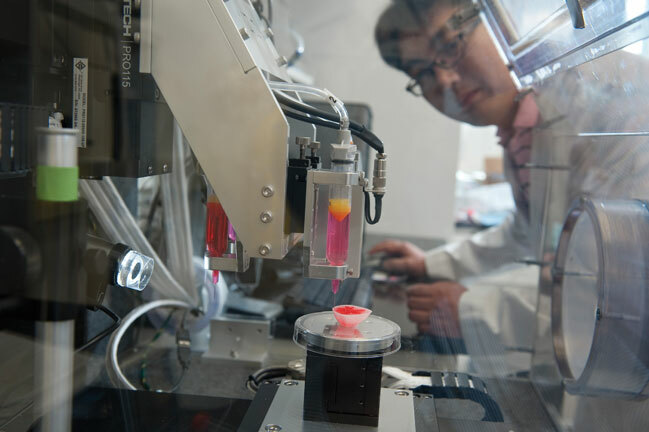 Now scientists are looking to improve factors such as the architecture produced during bioprinting, time required for bioprinting, preservation of phenotype/functionality of cells during bioprinting, the range of materials that can be employed for bioprinting and so on. AA: With 3D bioprinting, it is the cells themselves, often combined with biomaterials, that are printed to form tissues. Research has shown that with one type of bioprinting, microextrusion, cell viability is between 40 and 86 per cent, and that rates are even higher with inkjet-based bioprinting. Of course, nozzle gauge and other factors affect these rates. When can we expect to see full printed organs and what are the key steps we need to take to get there? DT: Currently, I am not convinced that whole functional organs will ever be printed. The biggest challenge is that every cell in your body constantly communicates with the cells around it. This biochemical communication is especially intense during tissue growth phases. The reason that this is necessary is that organs are made up of hundreds of different cell types. Cell development and behaviour draws on DNA properties influenced by the signals from surrounding cells. Because cells develop from a complex spectrum of differentiation, the diversity of cell types within a single organ is vast. There are a number of key fundamentals that need to be overcome first. Improved disposition technology, direct in-situ differentiation of cells and improvements in bioreactor-based tissue maturation processes are required. Currently, reliable extracellular matrix production and the potential formation of stem cell tumours are two of the biggest hurdles that need to be overcome. Any defect in a group of cells or any defect that causes part of the tissue to die could be catastrophic if a tissue was to be transplanted. Another conceivable application of bioprinting technology is veins, although immune system rejection is a potential issue. AA: The scientific process itself is not predictable, so it is really impossible to predict a timeframe. Certainly, simpler printed tissues, such as bone and muscle, will be implanted first. Areas of focus include developing new biocompatible materials with sufficient mechanical strength to maintain their shape and withstand external stress after implantation; improving printer resolution to duplicate the detailed architecture of organs such as the kidney; developing methods to vascularise and innervate printed engineered tissue and organs; and increasing the speed of printing. DE: The building blocks to enable organ printing are well underway through numerous research projects, but it is likely to take a decade or more before the techniques are widely used. There are numerous challenges that could broadly be categorised under: understanding how to control the ‘growth’ of active structures by moving complex cells into a coherent functional structure, developing methods of preventing rejection or infection of newly implanted structures, understanding how the structures would behave in the long-term and then, tackling the scaling up of the newly developed processes to make them economically viable. What is the current state of the art in materials to support cell cultures to form scaffolds of 3D-bioprinted tissues? And what research paths are being investigated for the next generation of scaffolds? DT: Infrared laser photo-cured hydrogel scaffolds are currently an area that is producing some very interesting results. This allows sub-100µm scaffold layers to be formed, rather than old-school biologically active materials in which 500µm were achieved. By seeding different growth factors into the scaffold, this may also provide a means to control the formation of coarse vasculature and innervation within certain areas of a specified architecture. The interesting thing is that a lot of technology and concepts from the printing and coating industry can be applied towards ultra-precision cell pattering. Methods using 3D screen printing are both ultra-high resolution and also have scalable potential. DT: The notion that you could culture a few hundred million adult cells and deposit them together to produce a functioning tissue is not realistic. This is due to cellular signalling mechanisms that tell stem cells exactly which genes to activate so that organs and tissues can self-assemble. Progenitor cell models are one line of research. We know from various experiments, that a variety of stem cells, if given the proper signals, will spontaneously organise themselves to turn into the right kinds of adult cells needed to create functioning tissues. 1. It a hydrogel with regions for cell binding and remodelling, so it mimics multiple aspects of the native environment of the cells compared to many other materials. 2. It has been proven to be biocompatible in mouse models, meaning it does not produce an adverse reaction upon implantation. 3. It is cheap and easy to synthesise and fabricate. Coming to the second part of the question, cells are inherently dynamic and materials that support and promote such dynamic behaviour of cells are highly desired. At the same time, such a material should also be susceptible to techniques such as bioprinting. So the material for the next generation of scaffold should be more complex in its ability to promote cellular behaviour and should have the ability to be manipulated by bioprinting. AA: As scientists move away from hand-fashioning scaffolds to bioprinting them, additional biomaterials will need to be identified. The material must not only be printable, but also must be compatible with the body and support cellular attachment, proliferation and function. 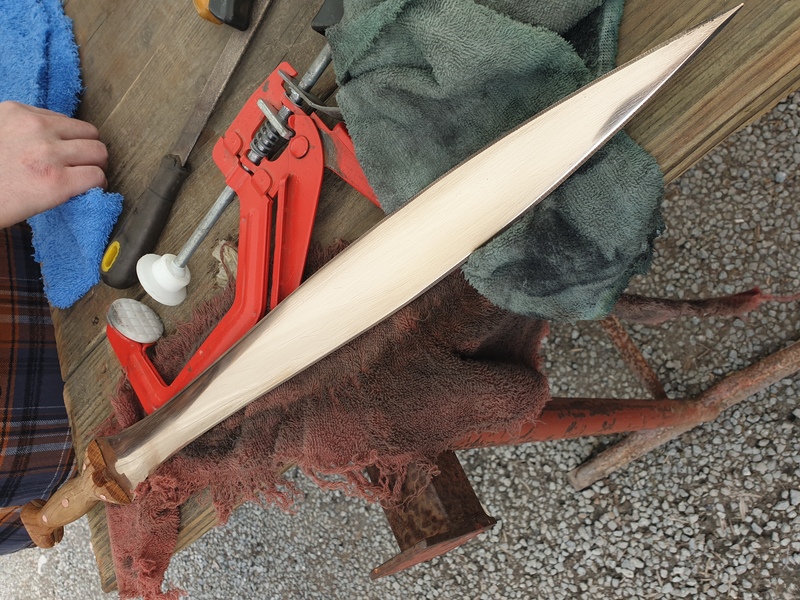 Also important is how quickly the material will degrade in the body. The degradation rates of the scaffold must match the cells’ activity in building a ‘home’ from their own extracellular matrix, the molecules they secrete to provide structural and biochemical support. In addition, material selection must be based on the mechanical properties needed for a particular structure. Different structural requirements will be needed for tissue types ranging from skin to liver and bone. To what extent is 3D bioprinting dependent on advances in stem cell research? DT: This is key towards the development of bioprinting technology. There is currently a lack of understanding when it comes to the kinetic mechanism of cells. Induced pluripotent stem cell lines seem to be the most reliable starting point. This is when any cell in the body can be differentiated into an embryonic stem cell and then re-differentiated into any type of cell. This powerful discovery was a real game-changer for bioprinting research. It is this model that is proven to be an effective way towards allowing for differentiated tissues to be produced. VM: As such, advances in 3D bioprinting do not mainly depend on stem cell research. However, for the collective success of tissue engineering, strides have to be made in stem cell research to a great extent. This is because stem cells are one of the most promising and sustainable cell sources for engineering artificial organs. Organovo ceo Keith Murphy refills the cartridge for printing human organs. AA: Cells are a key ‘ingredient’ in engineered tissues, so advances in stem cell research will be vital to moving the 3D bioprinting field forward. 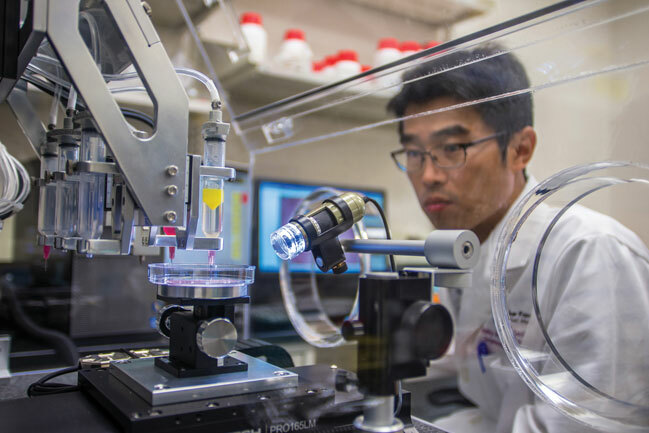 Whether future research yields new sources of cells or information about cell signalling and tissue formation or identifies new growth factors that can enhance the engineering process, the results will play a role in tissue engineering through 3D bioprinting. According to various sources, close bridges should be built between industry and academia to facilitate the progress of 3D bio-printing. What major practical engineering solutions would assist the development of 3D tissue printing technology (software, precision, cost of materials etc). JY and RW: Some manufacturers are focusing on the production of bioprinters for printing cells and biomaterials to make human tissues. Although the 3D printing techniques on these bioprinters have already been developed for non-bioprinting applications, various configurations have been modified to suite the printing of cells and biomaterials, particularly for research purposes. There are software products that can manipulate clinical images such as CT scans and export them into files that can be recognised by 3D printers. However, bioprinting usually involves placing multiple materials and cells into 3D structures; software ability in handling multiple components still needs to be improved. Some bioprinters have software that allow users to draw 3D structures with multiple components, this ability needs to be transferred to clinical images. A close bridge between industry and academia would certainly be beneficial in terms of identifying requirements in bioprinter hardware and software for fabricating human tissues and finding solutions. To date, the majority of 3D printing hardware has been adopted following its acceptance in other fields, but real opportunities lie in established 3D printing equipment manufacturers working closely with academia to understand the precise requirements for delivering tissue engineering problems and work together to solve the challenging, but exciting problems we face in this field. DE: Coming from a design background, I often feel this is a missing link that can facilitate a more reliable link between engineering and medicine. Developing technologies and software that can be used intuitively by the intended specialties is a crucial key to enabling more widespread adoption. Usability engineering/user centric design is commonly overlooked until a product or software has gone through to the final phases of development, but which time, incorporating changes that would make the offering more acceptable to the market is expensive and less feasible. In this respect, academics have responded to work more closely with industry and the public sector to help improve product/service offerings via a number of UK/EU projects. Another welcome method of facilitating better adoption of new technologies and techniques is for research projects to involve multiple academic, industry and end-use partners with a diverse range of skills sets. Where do the UK and US sit on iPS derived ‘prints’ for regen applications? What size & duration might be needed to satisfy the regulatory bodies to ensure no regression of cells, or behave in a contradictory manner once in a patient? JY and RW: The printing configurations which have been developed or are under development for other cell types can be applied to iPS cells. Particularly, embryonic stem cells which are delicate cells have been printed with high viability using a valve based printing technology. iPS cells can circumvent the issue of immune rejection. However, it is a relatively new cell source which needs a lot of investigation before it can be applied to the clinic. The applications in in vitro settings using these cells, such as toxicology using iPSCs derived hepatocyte-like cells, are currently a hot topic. Regulatory bodies will look into the safety and efficacy of the printed tissue engineering products. Various in vitro and animal testing have to been carried out to get approval from regulatory bodies for clinical trials. The criteria for efficacy of the printed constructs will depend on the targeted human tissue/organ. 3D or 2.5D. 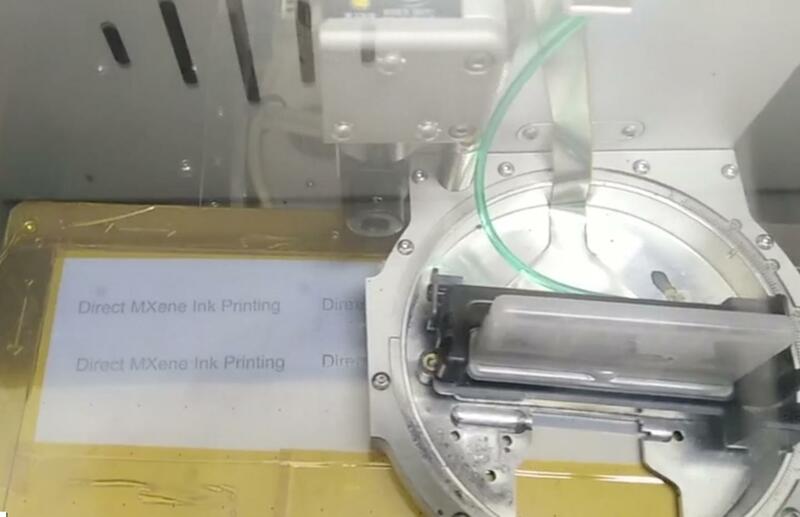 When does liquid dispensing become printing? Much work shown is 3D-compatible structures coated in a 2D layer. What are the experts’ opinions on this? DT: New processes are being developed all of the time based around this concept. In some cases, ‘ghost organs’ are used. This is where you start with a dead organ and remove all cells that have immune rejection functionality. What is left is an extracellular matrix that stem cells utilise when they locate themselves and self-assemble. In the short term, this mechanism for tissue engineering may yield very interesting results. JY and RW: Dispensing becomes printing when the material is deposited with control and precision. Some printing technologies are based on dispensing individual liquid drops and hardening them after dispensing, so a 3D structure can be formed by dispensing in multiple layers. The expected outcome of bioprinting is 3D functional tissues. Conventionally and still porous scaffolding is a major method for culturing cells to form an initial desirable structure. However, this method doesn’t allow the patterning of cells within the scaffold. With 3D printing, in principle multiple cell and biomaterial types can be patterned selectively throughout a 3D volume to mimic cell and extracellular matrix arrangements in vivo. What kind of tissues can be printed? And does post-print manipulation or processing aid in the development of the tissue (i.e. apply something to stimulate desired growth or further development)? DT: Post-printing bioreactor processes are also very important as a result in which many complex biological processes – differentiation, maturation and transformation – occur. This final stage towards the formation of a final architecture is vital. Researchers at Nottingham University are working on a number of interesting applications for producing tissues for reconstructive surgery. Sheffield University continues to make excellent progress with developing nerve repair technologies. Newcastle University continues to do excellent work into rebuilding vascularised bone tissue. Individually, these are really exciting areas of research that will yield future therapies to treat a number of debilitating conditions. Currently at Swansea, we work on tissues primarily for pharmaceutical testing. Here, MSC cells are used to make simple architecture heart tissue models. Our most complex tissue is eight 200µm layers thick, which consists of a simple multilayer structure. But there is still a long way to go before making anything more complex. JY: The complexity of tissues varies a lot. Bioprinting will more likely achieve clinical success first in simpler tissues such as skin, cartilage, blood vessel and tracheal. Solid organs such as liver and kidney will be the long-term challenge. The printed constructs may need to be matured in vitro, e.g. mechanical stimulation for tendon constructs, before transplantation, so they can survive better in vivo. This technology is very powerful; what is currently the most successful methodology and what future refinements need to be made? There are some really exciting companies: Organovo, Tedvideo, 3Dynamic systems and Cyfuse. Which one do you consider to be the most advanced at the moment? DT: There are so many refinements that need to be made to the methodology. The great thing with bioprinting technology is that there are so many people doing so many different things; this scientific method cannot fail to generate results in the end. There is not just one approach to solve one problem, but many different approaches to solve a whole number of different problems. There are a number of private companies that produce excellent systems that are ultra-precise and can be used for the purpose of bioprinting. Short term, I believe that systems that are able to make porous 3D matrix will provide a natural structure in which stem cells can congregate. This will allow for cells to migrate and then gather information from surrounding tissues, potentially differentiating into precisely needed cells types. JY and RW: Bioprinting is a relative new field which currently attracts a lot of research attention and some investment from industry. Several printing methodologies are available. Extrusion based bioprinting technology seems to be a major one that has been adopted by many bioprinter manufacturers. Organovo’s technology based on extrusion has found applications in drug development. However, in the future bioprinters that combine different printing modalities may become a trend due to the different advantages of these technologies. For example, bioprinter manufacturer regenHU has combined extrusion and micro valve printing technologies onto one machine. Cyfuse’s technology is exciting: it can automatically pick up building blocks which are cell spheroids and then place them into a 3D arrangement using a needle array. It is similar to Organovo’s technology in term of using cell spheroids as building blocks. Ink jet printing has the potential for depositing material at a resolution of the order of the length scale of cell, which offers further control over material composition and behaviour. This brings challenges in itself though, as each printing process has limitations on the type and character of the material that can be deposited.